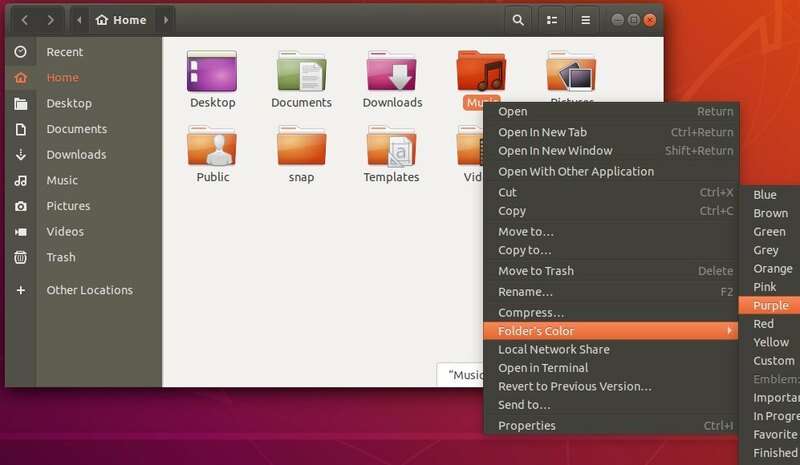 This quick tip shows you how to set custom color or emblem of a folder in Ubuntu 18.04 Nautilus file browser. For those who want to have a different look and feel on folder icons, folder-color extension allows to change the color or emblem of selected folder in the default Nautilus file browser. 1. Open terminal (Ctrl+Alt+T) and run command to install the folder-color extension. 2. Then re-open Nautilus (Files) file browser, and right-click on a folder. You’ll be able to choose a color or emblem, or set a custom color of the folder. Note that if you don’t see the context menu “Folder’s color”, quit Nautilus via command nautilus -q and open the Files again. Ji, Very simple and easy process. Not so sure I’m really bothered with folder colours, but at least I now have the option to choose. Cheers! Works like a charm :-) Thanks for that description. Awesome, works like a charm! Is there a way to do this from the command line? More specifically I want to automate the folder-color from a script. In Ubuntu 18.10 there is no apparent way to change the default colors for folders. That is almost as stupid as the default Orange color. HI , is there any way in UBUNTU where I can get back to default folder color (orange), I tried some installation , now I dont see the default folder color. it has turned to file icon and very diffcult to differentiate a file from folder. Did you try installing Gnome Tweaks (via Ubuntu Software) and changing the icon theme in Appearances tab. Does not work. Says something about it being insecure and not allowed. Why is it so complicated merely to change a folder color? We thought Linux was supposed to be easy.